I think they once removed my epidermis. If you sat on her couch on any steamy July afternoon in the 1970s, you got stuck. The backs of your sweaty thighs. Stuck. Temporarily adhered to yellowing plastic slipcovers. I should have thought before I plopped. Getting up was downright painful. The childhood equivalent of getting your lip waxed. I loved my grandmother. But I hated those plastic slipcovers. Hermetically sealed furniture was the all the rage in most Italian households of yesteryear. I secretly wanted to poke holes in them to let the trapped air escape. I imagined ripping off those covers and unveiling its pristine underbelly so that I could lose myself in those jaundiced cushions. Those slipcovers--iconographic relics of an Italian-American childhood--were made fun of in my circles for years to come. We all recalled their burnt vinyl smell and how we peeled ourselves from them on sticky days. We went to college, got jobs and homes, and then headed straight to Pottery Barn. Plastic slipcovers were simply gauche, like ill-fitting toupees, lipstick-stained teeth or Liberace. Three sons to be exact. Maybe I first realized this when my infant son projectile-vomited all over our unblemished red Pottery Barn chair. Or when I found the desiccated remains of a clementine and a chewed up hotdog between our buttery-leather sofa cushions. Or when I discovered the ball point pen reminder "KIM WAS HERE" scrawled on the back of my brand new mini-van seat. Or when I googled "how to remove crusty salsa stains". Or when I carefully dabbed the paint droplets that my tween-age son shot from a water pistol. It could have been any of those moments. Sometimes I want to laminate everything in my house. It's so much nicer than duct tape, after all. ROCKET SCIENTISTS, I tell you. I have learned so much from my grandmothers' generation. They didn't Zumba or have wistful memories of junior year abroad. There were no Facebook status updates with who won Friday Bingo or any hastily written texts reminding husbands to buy bread. And they certainly did not knock on the locked doors of opportunity that exist for women today. With their Saturday-coiffed hairdos and cottony house dresses, they trailblazed the way for many future generations to dream, to choose, to speak. To unlock those doors. Many of them were just born when women got the right to vote. It's hard to imagine where we would be without their wisdom, their work ethics, their courage to forge new paths. It's almost tragic to think of the velvety plush that existed beneath that couch. Elusive softness under shrink-wrapped furniture. Did those women--who Cloroxed and scrubbed and polished every household crevice--ever get to collapse onto their doughy couches? Probably not. I may have stuck to that couch--but women of my grandmother's generation made it so that I would no longer be stuck to a prescriptive life. Plastic Slipcovers for your feet. All I need now is a bouffant and a shift dress. 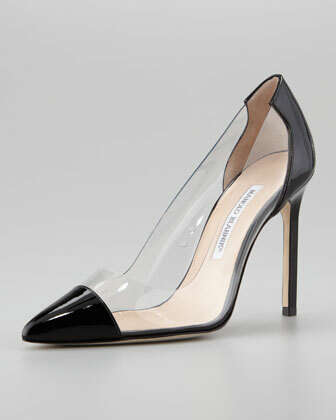 Love these PVC Pacha Pumps by Manolo Blahnik. This is great!. I still have relatives that have the slipcovers. The shoes are perfect for your child experience you shared with us. I can remember the feel of the plastic as I read this! And somehow, our Italian grandmothers got us comfortable enough on those plastic slip covered couches for naps. you brought me right back there ...... a great yet painful experience. we thought we knew it all but they were Geniuses !!!! Awesome!! Jewish grandparents had plastic also. Mine did anyway. And yes - I feel the same way. I find smooshed blueberries and trash stashed in my couch. I have about given up. I am thinking plastic deck furniture. Not just Italian or Jewish, Irish Aunts had them too! I think it was a non-American born thing! Today's answer to plastic covers is leather! You stick to that in the summer as well!!! My Aunt Rose had the same thing. Hermetically sealed heavy wood red velvet furniture in her formal living room.